Facts of Old English Sheepdog, "Scientific name for Old English Sheepdog, or domestic canine, is Canis lupus familiaris". "The fear of a dog Cynophobia". The Old English Sheepdog is a big variety of dog that is a native to England as the name suggests, and belongs to the early herding categories of dog. The Old English Sheepdog breed can grow an extremely long fur, covering the eyes and the face. Outdated names of the dog variety comprise bob-tailed sheepdog and Shepherd's Dog. This dog is still called by the nickname, Bobtail. The average height of the Old English Sheepdog to the shoulders is 21 to 24 inches (53.4 to 60.9 cm) and the average height of the female is 20 to 22 inches (50.8 to 55.9 cm). The average weight of the male is 80 to 100 pounds (36.2 to 45.3 kg) and the females is 60 to 85 pounds (27.2 to 38.5 kg). The Old English Sheepdog breed is a compact, strong, square variety dog. The top line of the dog is lower at the shoulders, sloping higher on the way to the back end. The torso of the Old English Sheepdog breed is wide and deep and the head is big in size, with a well-defined stop. These breeds have a black colored nose, and their teeth meet in a tight scissors bite. The Old English Sheepdog eyes come in blue or brown in color. The ears are medium in size and are carried level to the head. The Old English Sheepdog have straight front legs and circular back legs that are well-built. The Old English Sheepdog have smaller feet and they are circular with well-curved toes. The Old English Sheepdog breed is either born without a tail, or it is totally removed. A Old English Sheepdogs can hear a sound at four times the distance of a human. Sound frequency is measured in Hertz (Hz) Def-Hertz is the measurement of frequency, explicitly it's one cycle per second. The higher the Hertz are, the higher the pitched the sound is. Old English Sheepdogs hear best at 45,000 Hz to 65,000 Hz, while humans hear best at around 20 Hz to 20,000 Hz.Old English Sheepdogs sweat glands are between their paw pads. 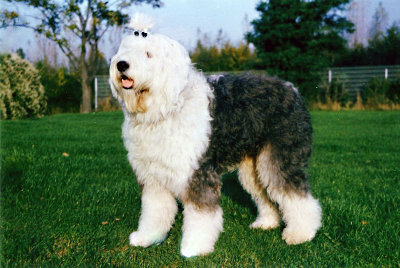 A Old English Sheepdog sees in color and have better low light vision. Dogs have three eyelids, a lower lid, an upper eyelid lid and a third lid, that is called a haw or nictitating membrane, this keeps the Old English Sheepdogs eye protected and moist. Old English Sheepdogs eyes have a special membrane for seeing better at night, called a tapetum lucidum - a dogs reflective layer in the choroid chiefly of nocturnal, causing the eyes to glow when light at night hits the eyes and they consist of some layers of smooth flat cells covered by a section of double deformed crystals. The Old English Sheepdog breed is steady, affectionate and friendly, and is capable of adjusting to different circumstances. The Old English Sheepdog are faithful, protective and clever, and they are an excellent family companion. This gentle-mannered breed loves and does well with kids, and has a strong herding nature and may attempt to herd people by knocking, not nipping, and are required to be trained not to herd humans. The Old English Sheepdog long haired, coarse coat requires continuous care to maintain it in good condition. Unless the hair is combed and brushed all through to the thick, water-resistant undercoat at least twice in a week, it will turn out to be matted and the Old English Sheepdog may suffer from skin problems, making it prone to Deafness, Hypothyroidism, (PRA) Progressive retinal atrophy, Cataracts, Canine hip dysplasia and horde parasites. The number one heath problems amongst Old English Sheepdogs is obesity, so always make sure your dog doesn't get to fat. Many foot problems that Old English Sheepdogs have are just an issue of long toenails. The average lifespan of the Old English Sheepdog breed ranges from 10 years to 12 years. If purchasing a Old English Sheepdog from a breeder, make sure to find a good breeder with references check at least two to three of the puppies that were purchased from this breeder. The Old English Sheepdog belongs to the Herding Group and in 1888 it was recognized (AKC) American Kennel Club. Only humans and dogs have prostates, But a dog doesn't have an appendix. Dogs have two times the amount of ear muscles than people. Dog’s nose prints can be used to identify them, their nose prints are like a humans finger print. A dog smells more than 1,000 times stronger than that of a human. A dog’s nose, secretes a thin layer of mucous that helps it absorb scent, after that they lick their noses and sample the scent through their mouth. A dog is an omnivore, (definition-they eat both other animals and plants). A Old English Sheepdog’s mouth can apply approximately 150 to 200 pounds of pressure per square inch and an American Pit Bull Terrier, German Shepherd Dog and a rottweiler can have 320 LBS of pressure on avg.